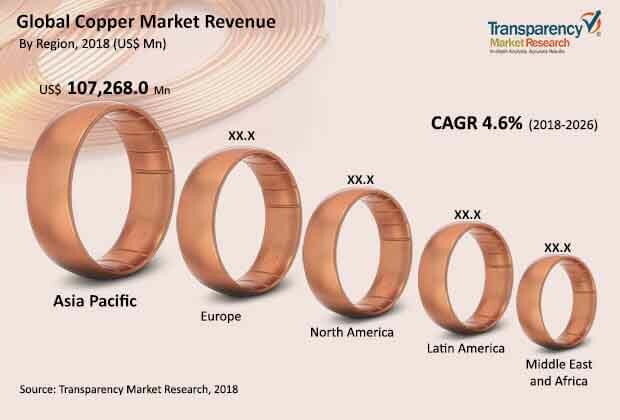 In terms of revenue, the global copper market is projected to expand at a CAGR of 4.6% from 2018 to 2026, according to a new research report titled ‘Copper Market – Global Industry Analysis, Size, Share, Growth, Trends, and Forecast, 2018–2026’ by Transparency Market Research (TMR). According to the report, the global copper market is expected to reach 32,932.1 kilo tons, in terms of volume, by 2026. The global copper market is driven by growth of automotive and construction industries across the world. The copper market in Asia Pacific is estimated to expand at a CAGR of 4.8% during the forecast period, owing to presence of a large number of manufacturers of copper in the region. Among types, the primary copper segment held a significant share of the global copper market in 2017. However, secondary copper was the most rapidly expanding segment in the year and the same trend is projected to continue throughout the forecast period. Request A Sample of Copper Market - https://www.transparencymarketresearch.com/sample/sample.php?flag=S&rep_id=2098? Based on form, the copper market has been divided into wire rods, plates, sheets & strips, tubes, bars & sections, and others. The others segment includes copper in the form of ingots, powder, etc. The wire rods segment held a leading market share, in terms of both volume and value, in 2017, owing to wide range of applications of copper wire rods. Copper has properties such as strength, ductility, corrosion resistance, and energy efficiency. This makes copper a choice of material for various electric and electronic products such as wires, power cables, and other industrial equipment. In terms of application, the global copper market has been classified into construction, transportation, appliances & electronics, power generation, distribution and transmission, and others. Construction, power generation, and appliances & electronics segments collectively held more than 70% share of the global copper market in 2017. Based on type, the copper market has been segmented into primary copper and secondary copper. Based on application, the copper market has been segregated into construction, transportation, appliances & electronics, power generation, distribution and transmission, and others. The others segment comprises ammunition coins, machinery, defense, etc. The construction segment holds a major share of the global copper market. This trend is likely to continue throughout the forecast period, owing to high demand for copper for use in construction applications to make taps, valves, plumbing, and fittings. Copper has advantageous properties such as high temperature resistance and it does not release toxic fumes in case of fire. Copper is antimicrobial and hence, copper tubes used in water systems can prevent bacterial infection. Also, durability and enhanced weather-ability make copper the best choice of material for construction applications. The transportation segment held the second-largest share of the global copper market in 2017. The segment is expected to gain market share by the end of the forecast period, due to rising adoption of electric vehicles. New copper applications being developed include antimicrobial copper-touch surfaces, lead?free brass plumbing, high-tech copper wires, and heat exchangers. Copper is one of the most traded commodities in the world. Copper prices are mostly fixed. Copper is traded by three major commodity exchange facilities such as the London Metal Exchange (LME), the Commodity Exchange Division of the New York Mercantile Exchange (COMEX/NYMEX), and the Shanghai Futures Exchange (SHFE). Copper prices are affected by various economic indicators such as GDP, Sensex, and news in financial markets. Copper prices are strongly correlated to global economic performance, as the manufacturing activity directly affects the demand for the metal. Copper prices increased by 27% in 2017 over that in 2016 and touched more than US$ 6000/ton. This is attributable to the large number of planned and unplanned shutdowns at major copper smelters, leading to lower production of copper that has created supply shortage. Copper prices are expected to register a sluggish growth rate from 2019 to 2021. Geographically, the global copper market has been divided into North America, Europe, Asia Pacific, Latin America, and Middle East & Africa. Asia Pacific is anticipated to hold a prominent share of the global market during the forecast period, owing to growth of automotive, construction, and appliances industries. This boosts usage of copper in the manufacture of copper motors, wiring, radiators, connectors, brakes, heat exchange equipment, pressure vessels, vats, etc. North America is anticipated to be a rapidly expanding region of the global copper market during the forecast period, followed by Asia Pacific. This is due to rising advancements in the transportation industry including new-generation airplanes and trains. Recently developed high-speed trains can use two to four tons of copper on an average, which is significantly higher than the one to two tons used in the traditional electric trains. Europe is another region with high demand for copper, due to presence of a large number companies operating in industrial machinery, transportation, and power generation industries in the region. The report comprises profiles of major companies operating in the global copper market. Key players operating in the market include Codelco, Rio Tinto, Glencore International AG, Freeport McMoRan Inc., Jiangxi Copper Corporation, BHP Bilition, Antofagasta Plc., Group Mexico, and Aurubis. Other prominent market players include Vedanta Resources Plc, Sumitomo Metal Mining Co. Ltd, LS-Nikko Co., and Tongling Non-Ferrous Metals Group. The report also comprises matrix of comparison between the top four players operating in the copper market along with the market share analysis for 2017. On September 27, 2017, the International Copper Study Group partnered with the Common Fund for Commodities, the International Copper Association, and the International Copper Promotion Council (India) for technology transfer in a project titled ‘High-pressure Copper Die Casting in India’. The project is related to the manufacture of rotors and motor systems by using high-pressure copper die casting parts that are highly energy efficient.